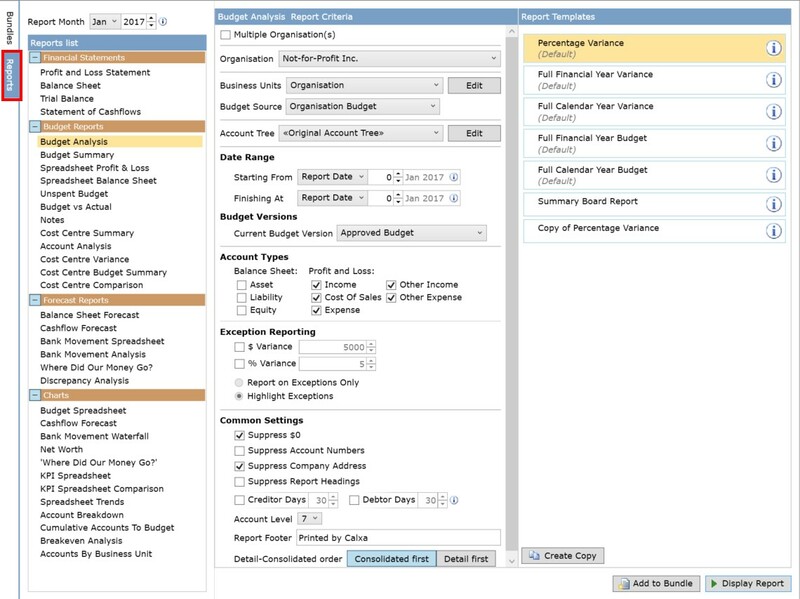 Select Reports on the left hand edge to see the full library of reports or Bundles to create or run bundles of reports. See the help note Using Report Bundles to Generate Batches of Reports for more information on Report Bundles. The left column categorises reports as Financial Statements, Budget Reports, Forecast Reports or Charts. The middle column captures the report criteria while the right column provides a number of templates for each report. Note: The templates on the right are variations on the same style of report and may include or exclude additional information. To see a description of each of the templates, click on the information button to the right of each template. Select the report and template you wish to run. The Report Criteria section allows you to set filters to suit your organisation's reporting requirements. For more details, refer to the specific types of Report Criteria below. With so many reports to choose from we thought we would start out by suggesting a couple of reports to get you started. Many of the suggested reports below are in our pre-configured bundles templates. Check out the help note Create and Manage Bundles to get started with a bundle template. This is one of the best reports for measuring your past performance, comparing Actuals and Budgets for the selected month (or quarter) and the year to date. You can include KPIs to provide extra information beyond the traditional Profit & Loss format. For a business, try the Budget Summary template (this includes a comparison to Last Year as well) and Not-for-Profits try the Budget Summary (Unspent) template as this also includes the Full Year Budget and shows what is left to spend. Use this report to see month by month how you are tracking, showing Actuals for completed periods and Budgets for the rest of the year – with a Projected Total to showing your most likely result by the end of the year. This is great for tax planning with your accountant as well. 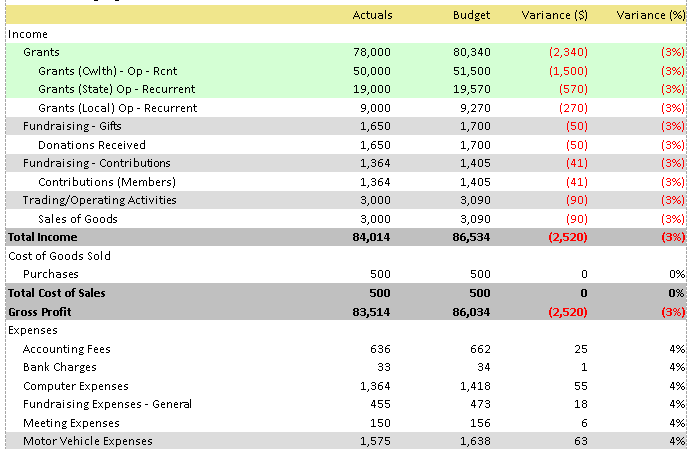 Not-for-Profits will find the Reforecast Unspent Budget Spreadsheet template a useful variation. Use either the chart or the report depending on your preference for something visual or for numbers. This report will show your predicted bank balance month by month. By using different Budget Versions you can see the effect of future plans on your cashflow. It’s not always obvious but finance is about more than the Net Profit and the bank balance. This report will help you understand the connection between those two, showing you what else has changed in your balance sheet. If you manage departments or projects use this report to get a clear, concise overview of the progress of each business unit. The centre column displays the report criteria and will vary depending on the report selected in the report list. Following is a description for all available criteria settings. In Calxa Premier you can consolidate multiple organisations. Tick the Multiple Organisations check box to select and consolidate multiple organisations. For more details, please refer to the help note Consolidate Multiple Organisations. For single organisation reporting, the Organisation dropdown menu lists all the active organisations available in the Calxa database. To manage multiple organisations please refer to the help note How to Manage Multiple Accounting Files. Select the organisation for which you want to run reports. Business Units allow you run reports for the overall Organisation or any selection of individual or consolidated Project/Department business units. To use this feature you should first have a firm understanding of Calxa Business Units. We recommend reading the help note Understanding Calxa Business Units and Budget Versions. Organisation Budget – uses the values from the organisation business unit in the selected budget version. Consolidated Departments – calculates the budget at report runtime by consolidating the values from all the Department business units in the selected budget version. Consolidated Projects – calculates the budget at report runtime by consolidating the values from all the Project business units in the selected budget version. If the consolidation of Projects or Departments equals your Organisation business unit then you should consider not maintaining an Organisation budget and instead use the Consolidated Departments or Consolidated Projects budget source. For more details on Organisational Budgets please refer to the Organisational Budget section of the help note Understanding Calxa Business Units and Budget Versions. Numbers Only – displays a comma separated list of selected business unit numbers. Names Only – displays a comma separated list of selected business unit names. Numbers and Names – displays a comma separated list of selected business unit names and numbers. Saved List Name – displays the saved list name. To change a business unit selection click Edit. For more information on this please refer to the help note Cost Centre Reporting with Calxa Business Units. Depending on which report you have chosen you may need to select a date range, single period or multiple periods. When selecting the individual periods, there are 4 different methods including Report Date, Fixed Date, FY Period and Calendar Month. For more details on these methods and a detailed explanation on using dates in Report Bundles please refer to the help note Understanding Date Selection in Calxa. The date range control allows you to select a starting and finishing date. The resulting report range is inclusive of these two dates. The summary for control is used when multiple reporting periods are derived from a single period selection. By selecting a single date the report may display Monthly, Quarterly and or YTD values ending with the selected period. The starting from control is used in multi period reports. Select the start date and the period range and number of periods are determined by the selected report template. In some reports you can replace budgets with actuals up to the selected period. By providing this value the report can calculate values such as the end of year forecast or unspent budget. Check the box to include actuals and select the appropriate period. For example if the above selection was used on a 12 month spreadsheet report, the monthly values displayed would be actuals for July 16 – March 17 and budgets for April 17 – June 17. The sum of the 12 monthly values provides a projected end of year forecast. 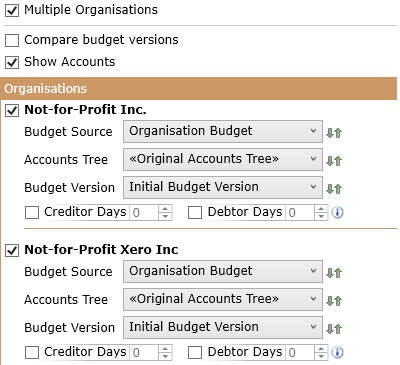 Calxa allows you to create multiple budget versions and can report on any of these. Select the budget version using the drop down menu. In some reports you can compare two budget versions, referred to as the Forecast and Approved budget versions. Tick the check box if you would like include two budget versions in your reporting and select both the Forecast and Approved versions from the drop down menu to include in your report. 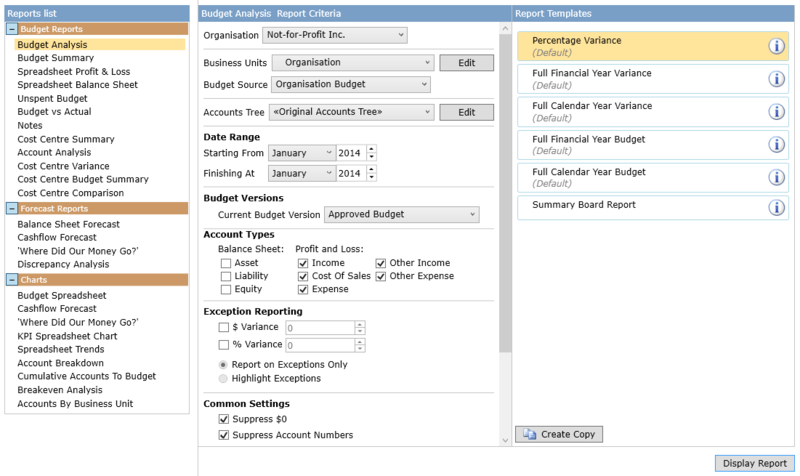 Note: When checking the Compare with approved budget version option, the available report templates will change. This is because different template are required to display the additional budget information. In addition to the standard account types, some reports can include Key Performance Indicators. In the criteria of these reports there are two separate options to Show Accounts and Show Key Performance Indicators. You may include either Accounts, Key Performance Indicators or both in a single report. Check at least one Show option or both to show additional criteria options. For details on reporting with Key Performance Indicators please refer to the help note KPI Reporting. 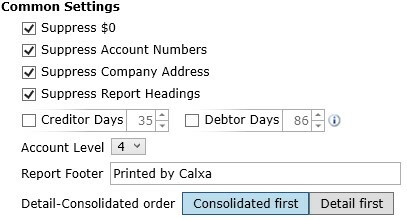 Account Trees (Calxa Premier only) provide flexibility in your chart of accounts by mapping your existing accounts to different saved views. You can re-group and re-order while maintaining the integrity of your reports. Select the Account Tree you would like to use or click Edit to edit or create a new tree. For details on reporting with account trees including how to create them please refer to the help note Account Trees - Rearrange your Chart of Accounts. Some report templates provide options for exception reporting. This is a tool that can help you quickly identify variances larger than a defined value. Check the $ and or % Variance checkboxes to enable exception reporting. Assign a value to the variance field and an exception is identified when the budget v actual variance for the selected reporting period is greater than both the $ and % values. Choose either Highlight Exceptions or Report on Exceptions Only. Highlighting exceptions (shown below) still includes all accounts in the report but highlights accounts with exceptions in green. Reporting on exceptions only results in all other accounts being excluded from the report, only the exceptions and profit totals will be displayed. For example with the selection above, the report will highlight variances greater than $500 as shown below. Common settings are settings that are common to all report templates. Changes to Common settings will be reflected in the criteria of other reports when you select them from the report list. Included options are as follows. Suppress $0 – When checked the report will suppress and hide rows that are all zero’s. Suppress Account Numbers – When checked Account Numbers will not be displayed in the report. Suppress Company Address – When checked the company address will not be displayed in the report heading. Suppress Report Headings – When checked the report header will not be displayed. 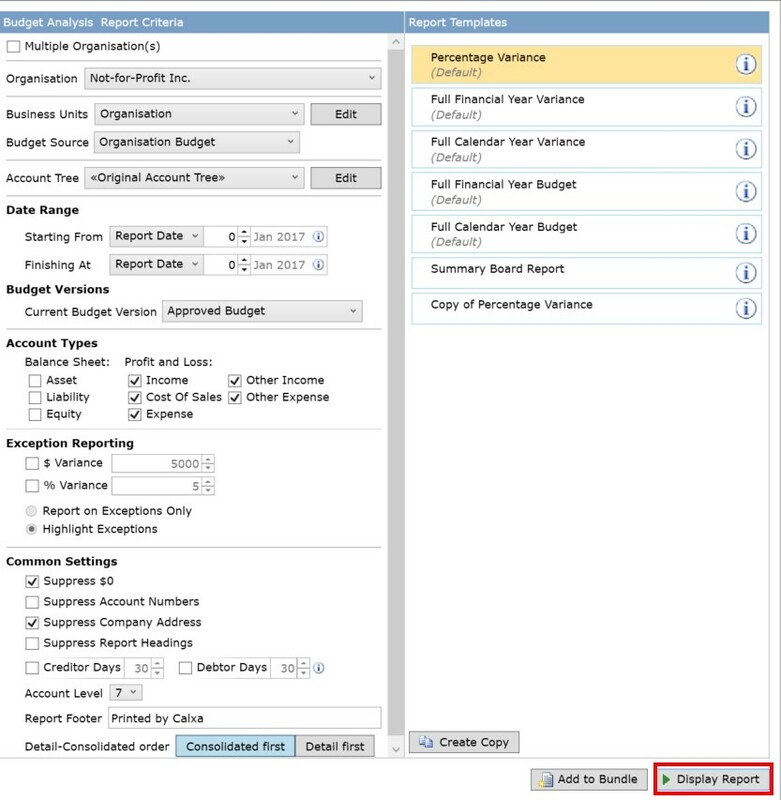 When unchecked the report header includes information such as the budget version, account tree and account types used. Creditor Days / Debtor Days – These options override the default creditor days and debtor days calculation and the days count will be applied to all accounts with the Creditor Days or Debtor Days cashflow type. For details on Cashflow Settings refer to the help note Preparing a Cashflow Forecast. Account Level – Change the account level to display a report with more or less detail. A lower number means less detail. For example running a report at level 1 will only show the account type totals and profit rows, while level 2 will additionally include the root level detail accounts and root level header account totals. Report Footer – Some custom text that will be displayed in the report footer. Detail-Consolidated order – When reporting with both Detail and Consolidated Business Units this option dictates which order the Detail and Consolidated Business Units will be displayed. For more details refer to the help note Cost Centre Reporting with Calxa Business Units.